Some of your loved ones might be awaiting a college offer – through a system that mightn’t make sense to many. Here’s our crash course. 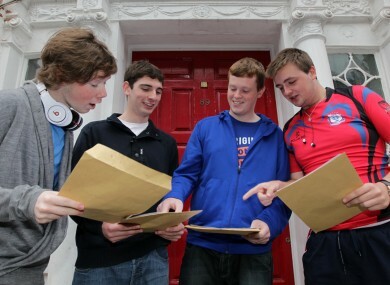 Four Leaving Cert students compare their results - and their overall points score - outside the Catholic University School on Leeson St in Dublin. This post was originally published on the 18 August 2012 but republished here as the CAO points for 2013 are being revealed tomorrow. TOMORROW MARKS a big day in the lives of thousands of young people in Ireland, as the first round of college placement offers are distributed by the Central Applications Office. The offers will dictate, for many, what they will study for the next few years – as well as where they might live, and how much college might cost them – or whether they may have to go back to school for another year to secure the grades they need. For most, though, it brings an end to the Leaving Cert experience – as students take their grades and book their places in the courses that they hope will lead them into the working world. While the CAO points system has become a rite of passage for many Irish people, it’s also something which can mystify the other people in their lives, who might never have gone through a similar system themselves. So, for those baffled by the system through which their children, grandchildren, siblings, nieces, nephews and friends are going, here’s our guide to how the whole thing works. Let’s start at the beginning: there would be no ‘points’ without a Leaving Cert in the first place. CAO Points are calculated based directly on a student’s grades in their Leaving. While every exam in the Leaving Cert does ultimately result in a percentage grade, this isn’t what students are given on results day. Instead, they’re given a letter grade which corresponds to the percentage score that they got. For higher level subjects, the points are exactly the same – except you add 40. (This is the reward that a student gets for opting to sit a tougher exam.) So, for an honours subject, a D3 gets you 45 points while an A1 will get you 100. From last year, colleges are also offering bonus points for honours Maths. The idea behind this is reasonably simple: the CAO only considers your best six subjects for points purposes, while many students actually take seven subjects – meaning they’ll be doing one subject which they know will not count for the purposes of getting into college. Knowing this, many students striving for top grades – and who knew Maths wasn’t their strong point – simply opted for the ordinary level paper in order to concentrate their efforts elsewhere. This, in turn, has led to fears about the mathematical capabilities of Irish school-leavers. In order to try and redress this, from 2012 the system offers 25 extra points for those who keep up their Higher Level Maths – giving them an advantage over other students who are happy to concentrate on other subjects. So, going back to the second table above, when you’re dealing with Higher Level Maths you can first add 40 points because it’s a Higher Level grade, and then add a further 25 points because it’s Maths. So a D3 in honours Maths now gets you 70 points; an A1 gets you 125. This means that previously, where the maximum points score a student could get was 600, it’s now 625. What many people misunderstand about the points attached to certain courses is that they are not a measure of the difficulty of the course. Although many of the high-points courses do tend to be among the toughest, the two aren’t directly linked. This is why students are always told to fill out their CAO forms by ranking courses based on genuine preference and not based on their actual difficulty. It might help to think of CAO points as a kind of special currency, created only for use in the college applications process. Put it this way: if you get a B2 in an honours subject, you ‘earn’ 80 points. Your six best subjects might altogether ‘earn’ you 400 points. You then use this money in an auction to buy your place on a course. That, in essence, is what the CAO does: it runs an auction. This is best explained with an example. Let’s pretend there’s a college called ‘TheScore.ie Institute of Sportology’, which runs a course called ‘Premier League Liveblogging’. Let’s pretend there are 50 places in this course. But if there are 100 applicants with Premier League Liveblogging as their first choice, obviously we have a problem – because the course can only take half of them. So how does it sort them out? By ranking applicants based on their points. This is the auction – the 50 applicants with the best CAO scores are the ones who will be offered a place. The other 50 will instead have to make do with a lower preference on their form – they’ll be offered whichever course closest to the top of their list, which they have also fulfilled the other entry criteria for (some courses, like those in Science, will demand certain Leaving Cert grades in the appropriate subjects). The whole point of this explanation is to underline that the points needed for the course aren’t simply based on how tough the course is – it’s merely based on the results of the people who want to get in. The points value that you’ll see listed beside the name of a course on the newspapers, or online, is merely the point beyond which applicants are going to be successful or not – it’s the ‘minimum price’ determined by the CAO auction. The first round of CAO offers – revealing the results of the first round of auctions – will be released on Monday. Further rounds will be offered over the next few weeks as extra places become available – if, for example, some people don’t take up their offers or colleges increase their capacity. To all those awaiting their offers, and to those standing by their sides: good luck. Email “Explainer: A beginner’s guide to the CAO Points system”. Feedback on “Explainer: A beginner’s guide to the CAO Points system”.